For the third year running, Scotland's Towns Partnership and the Cross Party Group for Towns and Town Centres are encouraging MSPs to take the opportunity during recess (1st July – 3rd September) to spend time in their local town. 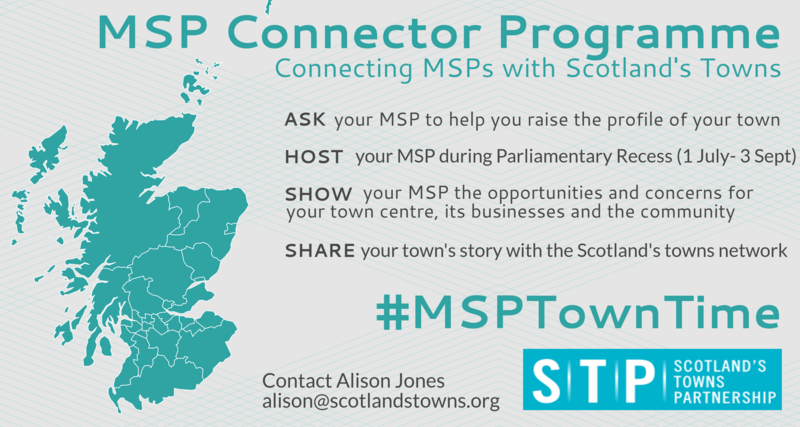 We are also seeking interest from town centre managers, community groups, local business organisations and other town stakeholders to host an MSP for the day in their town. MSPs are welcome to take part by spending a day in their local area, connecting and sharing with local businesses and the community. We want to raise the profile of our towns to MSPs and this is an important campaign to celebrate and raise awareness of the opportunities and barriers our towns face. Scotland's cities and small and rural towns and settlements are also welcome to take part. “The majority of Scotland’s population lives in towns and smaller settlements. Vibrant towns are key to the prosperity and wellbeing of communities across the country, with each town having its own unique identity and history which should be recognised and celebrated. 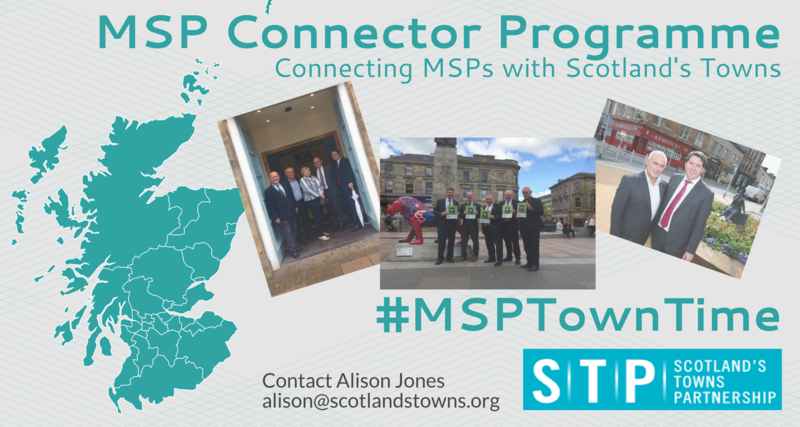 I welcome the MSP Connector Programme as a positive initiative to raise the profile of our towns. I encourage MSPs to visit their local towns this recess in order to connect with local communities, to learn about current challenges and successes, and to discover all our towns and town centres have to offer”. STP will invite MSPs to take part in a visit and for towns and business to host their MSP. The visit may include a walk around, presentation, lunch, work experience or something a little more creative! We are looking for lots of tweets, photos and highlights from the visits to help us raise the profile of Scotland’s towns. By sharing your experiences with STP, we can disseminate these with the wider towns’ network and add to best practice examples for all to access. An online Storify report will summarise highlights from all of the visits! STP along with the Cross Party Group on Towns and Town Centres are therefore keen to hear about the activity taking place in towns across Scotland and we would be delighted if you’d like to take part. Join the discussion on Twitter @ScotlandsTowns #MSPTownTime. To take part either as an MSP or a host, please register your interest with Alison Jones via alison@scotlandstowns.org · 07747 772712. To provide us with the necessary information and help with the organisation of your visit, please download our campaign toolkit here.